A number of tiny non-stinging wasps, mites and flies cause abnormal growths to develop on the leaves, or twigs of oak trees. These galls can include growths that are round, spiny, flattened, elongated or star-shaped. There are hundreds of different types of galls; each of which is caused by a specific insect. 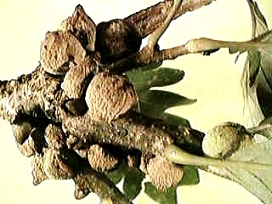 Galls form in response to a chemical that the insect injects into the plant tissue. Eggs laid by a mature female hatch into legless grubs around the gall forms. The larvae feed, develop, and pupate inside these galls. The adults may emerge either the same season or may overwinter inside the gall depending on the life history of that specific insect. Generally, these gall insects do not cause significant damage to their hosts though some of the leaf galls can cause deformity to make a tree unsightly. Also, severe infestations of twig galls can cause twig dieback or, in rare cases, death. However, just because a twig is covered with galls does not mean that it is dead. Twigs that otherwise look like a solid mass of galls may still leaf out in the spring. Insecticide sprays applied when galls are noticed are ineffective since damage has already occurred. Also, the larvae are unaffected due to the protection afforded by the gall. Emerging adult wasps and flies can be killed by insecticide but long periods of emergence and short residuals of most contact insecticides make this impractical. Stem twig galls can be pruned if this is deemed to be practical and necessary. In short, this is a problem that is best ignored unless pruning is done to improve the appearance of the tree.